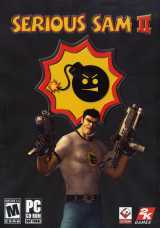 This sequel to the popular original, runs on the newly designed Serious 2 engine with graphics, environments and physics that are 100 times more complex than previous Serious Sam games. It maintains the same level of extreme action that Serious Sam is known for. Despite its jaw-dropping visuals, Serious Sam 2 will surpass the onscreen enemy benchmark that the original Serious Sam games set. Sam travels through various different worlds collecting parts of a medallion in an effort to defeat Mental, an extraterrestrial overlord who seeks to destroy humanity. The player begins with a certain number of lives that represent the number of times the player is allowed to lose all of his health and re-spawn immediately from the last saved checkpoint. There are over 40 beautiful, expansive levels spread out over 7 unique environments. Sam will travel through thick jungles, murky swamps, frozen tundra, futuristic cities, volcanic planets, and more. Each level is seriously enormous and there are 45 newly designed enemy types for Sam to face. The series is known for its outrageous enemy personalities, and it gives players a lot more to laugh about. There's also new vehicular and animal-back combat. Sam is guided by the Sirian Great Council and receives sporadic aid from the natives of the worlds he visits. The multiplayer mode includes online co-op and deathmatch, the latter having been introduced in a patch. Blood and gore effects have been improved relative to the previous games, and all enemies other than bosses can be gibbed.